A thought piece drawing on the work of leading thinkers and doers from around the world, to spark debate on how we understand ‘green industry’ in the 21st century. To foster local economic prosperity, livelihoods, and employment, we need to consider how to support existing and emerging industries that do not fit the traditional image of ‘industry’. In the 21st century, societies are facing intense challenges with the breakdown of an old economic order – automation & robotics, globalisation, and capital which can migrate where labour cannot, have undermined social stability and even governments. Technology is also enabling the ‘crowd’ to self organise and bypass traditional industry entirely. As old industries are dying or moving offshore, robbing thousands of people of the means to make a living, rethinking what we mean by the label ‘industries’ becomes essential. There is a need to promote and foster modern creativity and innovation in Australia in order to compete internationally beyond resource booms. What preconceptions does the word ‘industry’ carry with it from the 19th and 20th centuries, and are they still valid, or complete, in the 21st century? This definition infers that only manufacturing products, and only product or service provision by businesses is ‘industry’. Industry is much more than factories and materials — it’s about creating value. Industry is the production of value within an economy — and value is created differently in the knowledge, digital and artisan economies of the 21st century. Coding is ‘industry’. The biggest companies of the early 21st century include tech giants like Google and Facebook. Digital infrastructure is as critical as physical infrastructure to economies. There are a number of points where all of these overlap. Between them, they have the potential to create new employment opportunities, and also to disrupt existing industries — and the best-laid plans of governments. The Maker Movement will emerge as the dominant source of livelihood as individuals find ways to build small businesses around their creative activity and large companies increasingly automate their operations. community workshops where people can access versatile, digitally-controlled manufacturing technologies, open source designs and training, and likeminded people working on collaborative projects in a wider ‘maker’ social movement. These spaces help entrepreneurs to prototype new products, open up opportunities to tackle obsolescence and waste, and create communities to support both. Having access to tools and technologies is important, however access to other people and their knowledge and networks is also a major asset. Fostering spaces both online and offline that enable people to share skills, resources and expertise enables ‘crowdsourcing’ of knowledge and refining and support of ideas. The economic potential of nurturing an ecosystem of these spaces is significant. From Shanghai to Seattle, hackers, tinkerers, enthusiasts, self-learners and entrepreneurs of all ages and abilities are applying a ‘hands on’ approach to constructing the world around them. Leveraging a confluence of digital and analog toolsets, makers are deftly handling both smart styluses and soldering irons to take their concepts from idea to prototype to market reality. What defines the influence, scope and power behind this movement is its optimism in action-the belief in individuals’ ability to enact change, and then to do it. Individuals are empowered by a growing array of alternative ways to engage in the economy — taking advantage of new services and marketplaces to share, shop, sell and scale. Communities are championing maker efforts to revitalize urban centers, stimulate small business and provide a competitive advantage to attract even more business. Curiosity, ideology, necessity: whatever the reason, people are relying more heavily on their own hands and brains to meet daily needs. By experimenting with self-sufficiency, individuals are recognizing their own power through everyday action. Makerspaces and private/public fab labs are popping up everywhere, allowing communities to teach themselves new skills that could revive local business or traditions in craftsmanship. Massive person-to-person interactions are changing the landscape of information exchange and political action. Rather than waiting for institutional change, individuals are banding together to initiate social reform. The barriers of access to making have come crashing down, as simplified design tools and cost-effective DIY kits provide individuals with cheap means to make extraordinary projects. Makers and hackers are pairing indigenous materials, found artefacts or repurposed tools with lab-grade technology to tailor solutions to local community needs. 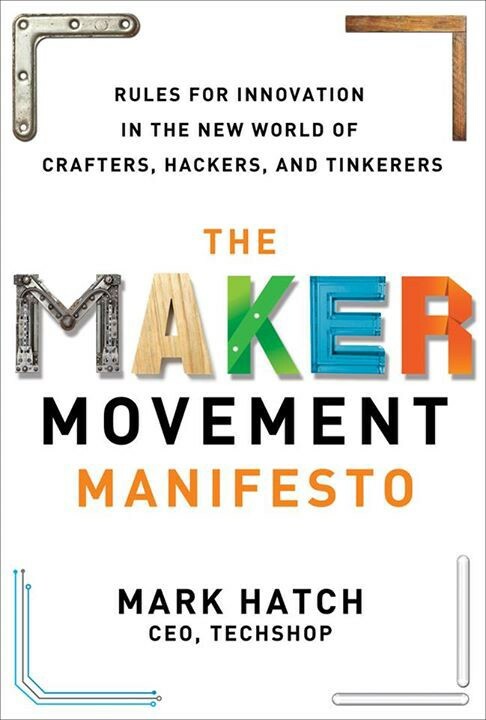 The Maker Movement is far more than just DIY, tinkerers and hobbyists. How maker-related technologies improve prototyping and testing for small companies and start-ups. How a new ecosystem of businesses and service providers are connecting individual makers with production capabilities in manufacturing hubs like Shenzen. How a similar ecosystem might catalyze a resurgence of smaller-scale, local manufacturing. Examples of how large corporations are experimenting with ways to engage with and benefit from the growing maker movement. 3D printing is going to catapult us into the future, but rather that it’s actually going to connect us with our heritage, and it’s going to usher in a new era of localized, distributed manufacturing that is actually based on digital fabrication. Over the last decade, a culture of makers, empowered by new production technologies and driven by an open source ethos, have reimagined the way that physical objects are created and distributed. Now, makers are bringing that same mindset to the urgent challenges in our cities. In these Maker Cities, citizens and startups are a force alongside government and industry to develop and improve our urban infrastructure and build entirely new systems that touch nearly every aspect of civic life. This conception of ‘making’ evolving from production of material objects to remaking systems has profound and exciting implications for addressing a range of social, economic and environmental challenges. …somewhere in the course of entering the pop culture zeitgeist, the warm and fuzzy self-empowered “maker” idea got turned into an engine for output and profit...a 3D printer consumes about 50 to 100 times more electrical energy than injection molding to make an item of the same weight…daily, we read swooning odes to the 3-D printer, the CNC router and other cutting edge manufacturing technologies but read almost nothing that approaches these developments through a much-needed critical lens. There are also excellent critiques on many aspects of the maker movement in the Journal of Peer Production issue on ‘Shared Machine Shops’ which investigate how far these initiatives live up to their stated social mission. The Fab Lab concept was originated by Massachusetts Institute of Technology (MIT), and there are now around 150 around the world. 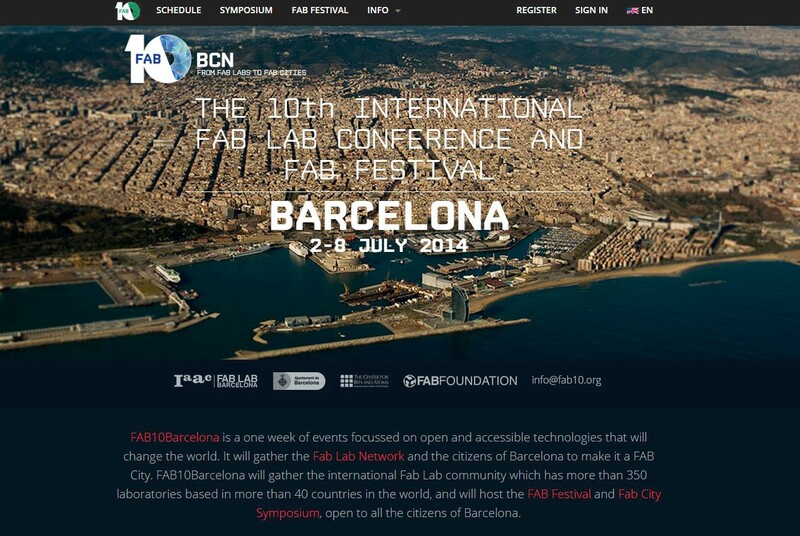 The City of Barcelona, which recently hosted the International FabLab Conference, has recognised the value of the maker movement, and seeks to foster these innovative and self-sufficiency projects. The City, spearheaded by its Chief Architect, is developing a plan which is investigating how to make cities productive again; how to encourage open-knowledge initiatives in a city; and how to create a city where people can ‘use things’ instead of owning them. 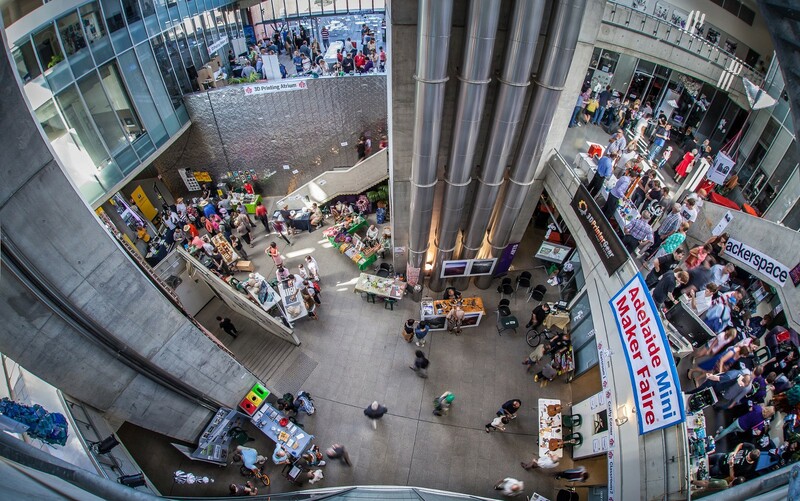 The City of Oakland, California has an initiative called Oakland Maker City — to give all citizens the tools, resources, and opportunities to grow, learn, and explore their interests, and to equip residents with the skills they need to collaborate on solving the problems in their communities and build new things collaboratively. Tech Shop is a network of facilities in the US that describes itself as ‘a playground for creativity — part fabrication and prototyping studio, part hackerspace and part learning center’. Offering access to over $1 million worth of professional equipment and software, TechShop facilities include laser cutters, plastics and electronics labs, machine shops, wood shops, metal working shops, textiles department, welding stations and a waterjet cutter, and members have open access to design software. As the momentum towards openness gathers steam, people increasingly want the ability to fix, upgrade and personalise products. This will impact on hardware and software design, but also the development of a supportive ecosystem of services and communities to tackle obsolescence, such as hackerspaces, fixit clinics, repair cafes. It emphasises the local, handmade, artisan over mass production. Common Libraries is also a partner of the ‘Making Libraries’ initiative, which is about reinventing libraries to be places not just to access knowledge, but to create and share knowledge. In her piece ‘Taking the Maker Movement to Washington, DC’, Etsy advocate and policy officer Althea Erickson offers some proposals to support the emerging maker economy (read the full document here). 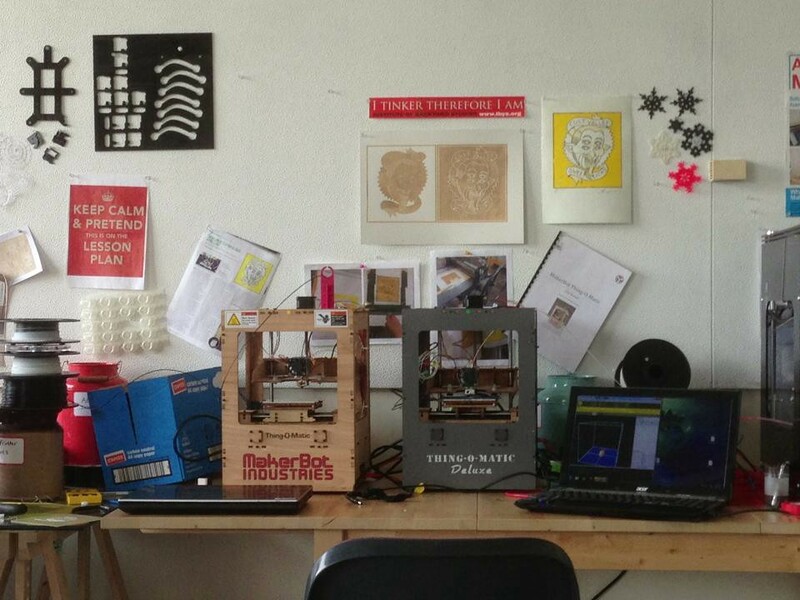 The maker movement is on the rise. There are already over one million Etsy sellers worldwide. Together, they sold over $1.35 billion worth of goods in 2013. The emerging maker movement offers the tantalizing promise of a better economy — one that puts people at the center of commerce, promotes local, sustainable production, and empowers anyone to build a creative business on their own terms. Yet makers face many challenges. As micro-businesses, they operate in gray areas between amateur and professional, business and worker, consumer and provider. They are inconsistently captured in government statistics and poorly understood by policy makers. If we are to fulfill the promise of a people-powered economy, governments should enable micro-entrepreneurship, support small-scale commerce, and foster economic security for all. The Maker Movement enables a way of relocalising production, and building prosperity locally by providing opportunities for people to develop a livelihood, as globalisation continues to push jobs offshore, and automation continues to make them disappear altogether. The shift from a top down to distributed means of production heralds a seismic shift for 21st industries — both the emerging ones and those they will disrupt. Technological innovation is enabling the means of production to shift from the top-down hierarchical models of the Industrial Revolution, to distributed, networked ‘peer production’. This shift, which has only just begun, will create monumental changes for just about every industry. One notable canary in the coal mine was the 2012 decision of Encyclopaedia Britannica (est 1771) to cease production of its printed version after 244 years. Wikipedia, the Internet’s free and open encyclopaedia and sixth highest ranked website in the world benefits from almost 200 times the number of contributors and 60 times the number of articles. There hasn’t been a drop in the ‘demand for knowledge’; rather, there is a definite shift in the way people obtain their knowledge, and that is a shift towards an open source model propped up by a gifting economy. …that the internet is creating not just a great horizontalisation in communication, but also new forms of cooperation and actual ‘production’, not just of knowledge and code (software), but also the capacity of making things in a wholly new way. It is now possible for people to meet together, declare their joint intention to produce something, and go about organizing this using a combination of ‘virtual’ and ‘physical’ means. These systems are based on people engaging with their passion, ie. doing things they actually want and like to do, to create a community around it, and to start jointly producing their knowledge online, but also physically coming together in new types of co-working such as hackerspaces, co-working hubs, and the like. Just as mutualizing immaterial things such as knowledge, code and design are now possible through internet cooperation, eg. the miniaturisation of the immaterial means of production, just so it is now possible to mutualize physical production, through the miniaturisation of manufacturing machinery, such as 3D Printing and other forms of distributed manufacturing. The new rule is: heavy is near, light can be far away, ie. producing locally but cooperating globally. Open source design and manufacturing can apply to any industry. The idea is that anyone with web access can download the design, make their own (using readily available materials), test it, improve the design, and republish it. It used to be that there were two primary dimensions along which you could divide things. 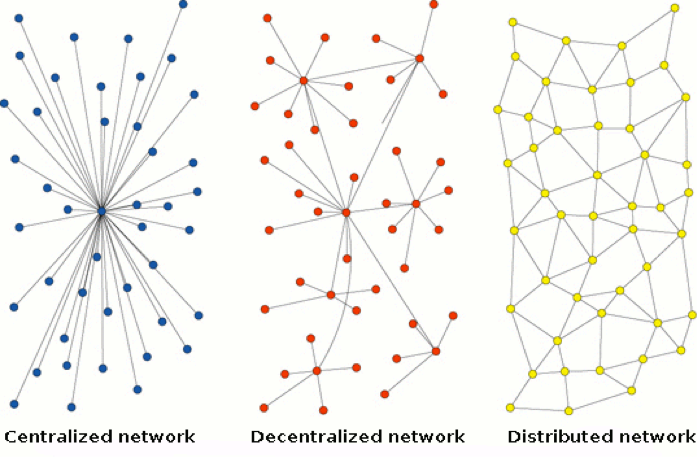 They could be market based, or non-market based; they could be decentralized, or centralized. The price system was a market-based and decentralized system. If things worked better because you actually had somebody organizing them, you had firms, if you wanted to be in the market — or you had governments or sometimes larger non-profits in the non-market. It was too expensive to have decentralized social production, to have decentralized action in society. …social production is a real fact, not a fad. It is the critical long-term shift caused by the Internet. Social relations and exchange become significantly more important than they ever were as an economic phenomenon. In some contexts, it’s even more efficient because of the quality of the information, the ability to find the best person, the lower transaction costs. It’s sustainable and growing fast. 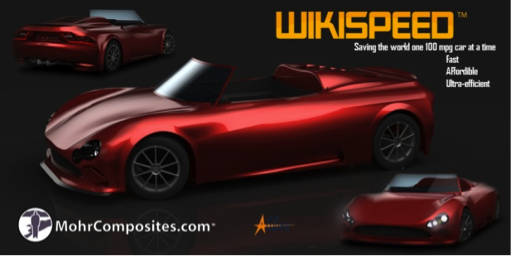 WikiSpeed is a green automotive-prototyping company comprised of a collaborative team of skilled individuals who volunteer time to design and build safe, low-cost, ultra-efficient, road-legal vehicles. The main goal is to reduce pollution and stress on global resources generated by traditional automobiles. WikiSpeed goes from 0 to 100 km/h in 5 seconds with a top speed of 240 km/h, and fuel consumption as low as 1.5 litres per 100km. 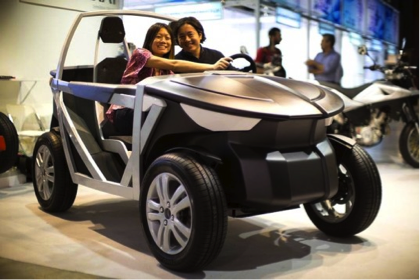 Open source software is one thing, but an open source vehicle? ‘Tabby’ is an open source framework for the creation of vehicles. The car’s blueprints can be downloaded and it can be built in 42 minutes, for less than 4000€. 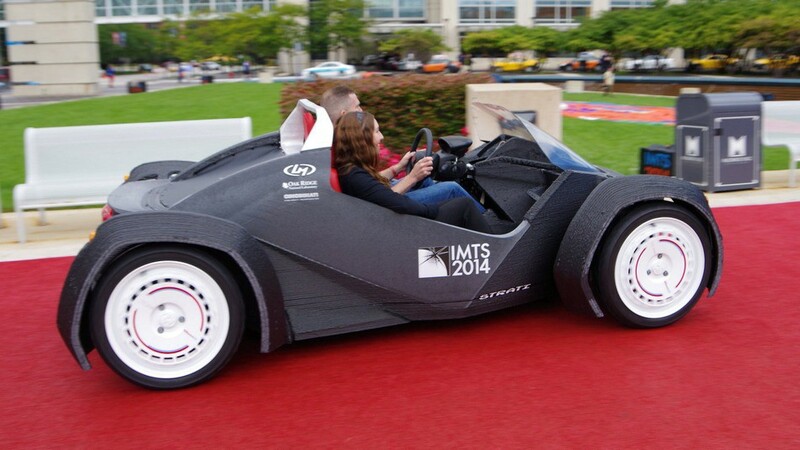 One day, in the not-too-distant future, you’ll be able to walk into a car dealership, choose a design — including the number of seats — and have a 3D printed car by the end of the day. Made from blueprints which can be downloaded from the internet for free, the 68-square-metre wood-framed home has been built without involving teams of builders. It is the first time a two-storey house has been digitally cut and built using open source technology. And it took a small group of volunteers just eight days to put together the component parts – which were manufactured using a form of 3D printing. In rural Missouri, USA, Open Source Ecology are developing open source industrial machines that can be made for a fraction of commercial costs, and sharing the designs online for free. 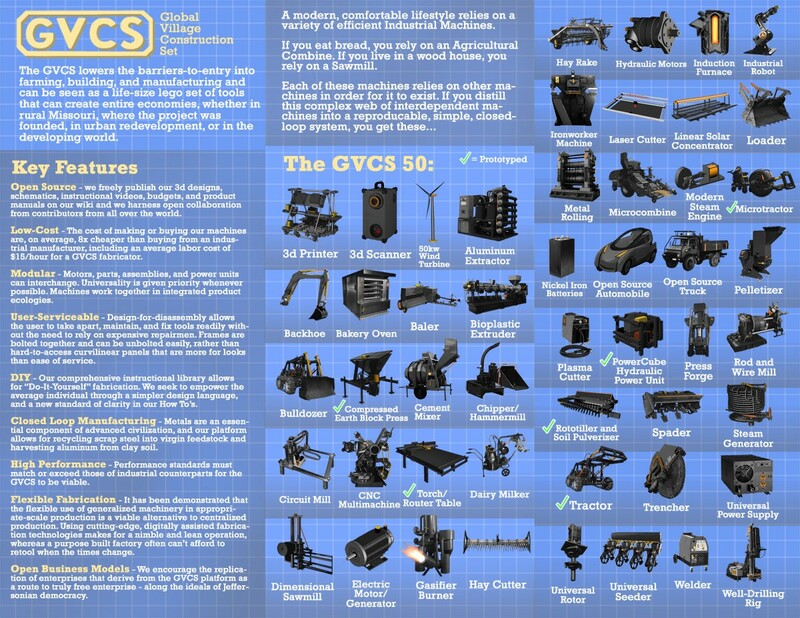 Open source blueprints include the Global Village Construction Set (GVCS) – a set of the 50 most important machines that it takes for modern life to exist – everything from a tractor, to an oven, to a circuit maker. OSE plan to develop a modular, scalable platform for documenting and developing open source, libre (free) hardware – including blueprints for both physical artifacts and for related open enterprises. 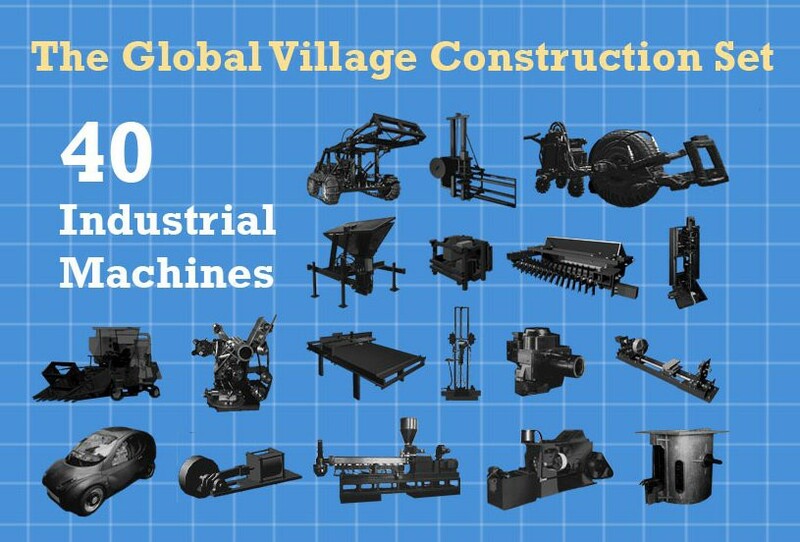 The Global Village Construction Set was recognized in Time Magazine’s Best Inventions of 2012. Openknit makes an open source, low cost (under $1000) knitting machine, on which customised clothing can be made from digital files, with the production of a jumper from raw material to end use taking about an hour. Extreme Manufacturing is a set of technical practices and management principles to go from an idea to a product or service in the customers’ hands in less than 7 days. Imagine encouraging young people to become part of an ‘Extreme Manufacturing’ team, providing hands on learning, product prototyping, development of team work and interpersonal skills as well as a trade and production ethos relevant to the 21st century. The Open Source Manufacturing ethos challenges the top-heavy, command-and-control forms of consumerism and instead advocates decentralised ideas based on openness, sharing and peer-to-peer collaboration. Open Source Manufacturing is a new industrial model which is challenging the supremacy — and even survival — of proprietary models, as communities gather to build things in a commons-based peer-production process. Co-operatives are an industry sector that creates secure jobs while relocalising economic activity and capturing wealth where it is created. A recent report by the International Organisation of Industrial, Artisanal and Service Producers’ Cooperatives revealed that more than 250 million people work in co-operatives, with 15 million of those being employees, 11 million as worker-members, and almost 224 million producers are members of co-operatives. …the popular conception of innovation revolves around tech / startups / for-profit business. There are different types of innovation. Co-ops are more about social than technological innovation. We don’t value social innovation as much as tech innovation. Social innovation doesn’t get nearly the same level of resources or attention. We’re blind to how big and diverse the co-op sector is because the mainstream media doesn’t cover it. Co-ops employ more people than the Fortune 500. There are 800 million co-op members globally. An an example of co-op innovation is the Seikatsu Club consumer co-op in Japan, perhaps one of the most innovative retailers in the world with 200,000 members and approaching a billion in turnover. They do direct from manufacture distribution based on actual demand leveraging their network of neighborhood hubs (homes). They carry a limited number of products that are household essentials and make sure each product is top quality. They’ve forced their beverage suppliers to standardize containers to cut down on cost and waste in the supply chain. They are buying their suppliers and converting them to co-ops. With the withdrawal of government from the funding of social services, and the rise of austerity policies that have attended the current economic crisis, there is an urgent need for new forms of social care. Over the last twenty years, social and solidarity co-ops have emerged as a new form of care that not only provides care to citizens but also reforms the purpose and direction of social care itself. Pioneered in Italy, social co-ops are a new form of open co-operativism in which multiple stakeholders work together to provide a wide range of social services not only to co-op members but to the community as a whole. In California, the Worker Co-op Academy is now providing assistance to support the formation and expansion of worker-owned businesses that will provide good jobs for low to moderate income workers. In Maine, over 60 employees of three retail businesses banded together to buy the stores, creating the the largest worker cooperative in Maine and the second largest in New England. New York City has just invested over $1 million in a comprehensive program to support the development of worker cooperatives, including directing existing business development resources to be more supportive of worker co-ops. You don’t give a corporate tax subsidy to somebody and hope they’ll create some jobs that will pay a living wage…You give it to people who are running a democratically owned business. They tend not to vote to dissolve themselves or ‘offshore’ themselves. Instead of subsidising big business with taxpayer money to effectively buy jobs and export the value created, we should invest in our people and their passions, ideas and abilities. One of the most powerful ways to keep wealth in a local economy is through not for profit enterprise. In this talk on ‘An Economics of Enough’ for the Adventures in New Economics series in Totnes, September 2014, as part of his How on Earth speaking tour of the UK, Post Growth Institute’s Donnie Maclurcan discusses how post-capitalist economics, the open source/peer to peer movement, addressing both extreme inequality and ecological overshoot, creating purposeful livelihoods and sustainable business can be addressed through not for profit business models. The State of California made it legal to sell homemade food in 2012, with the law going into effect in 2013, and in doing so paved the way for the launch of over a thousand new local businesses. The California Homemade Food Act (AB 1616, aka ‘Cottage Food Act’) to legalise cottage food was overwhelmingly popular with lawmakers, passing the California State Assembly 60 to 16 and unanimously passing the state Senate in August 2012. Upon signing the bill, Gov. Jerry Brown praised AB 1616 as a way to make it easier for people to do business in California. Changing a law stimulated local enterprise. There was no enormous investment of public funds needed to help real, sustainable livelihoods to flourish. If we are concerned with local economic prosperity, livelihoods, and employment, we need to consider how to support ALL potential industries. Compiled/curated from a range of sources by Sharon Ede, founder of Share Adelaide, co-founder of the Post Growth Institute, sustainability communications blogger at Cruxcatalyst and initiator of a State government project to map community sharing assets.